What wouldn't we give to have a weekend getaway home, far away from the maddening crowds and endless noise of the city! 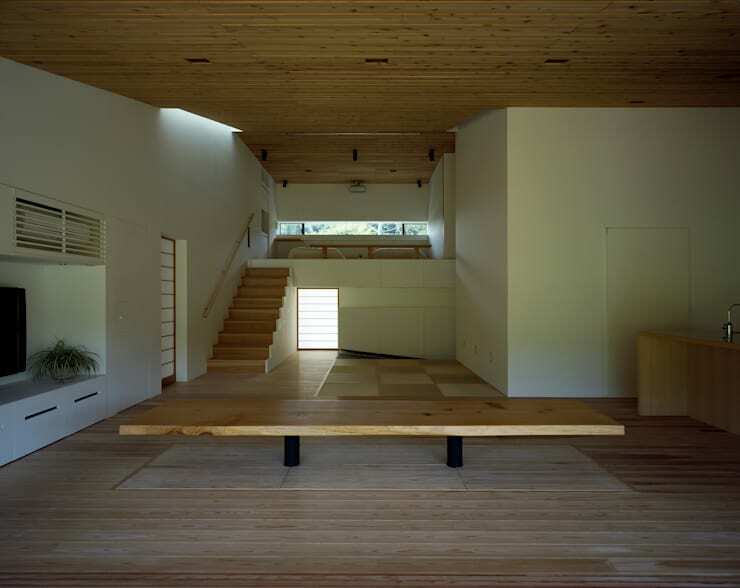 The house we are looking at today belongs to a couple who reside in bustling Tokyo. The duo wanted to be able to get away for a short break and some much-needed R&R every now and then, but not have to worry about finding (and booking) the perfect place to do so every time. 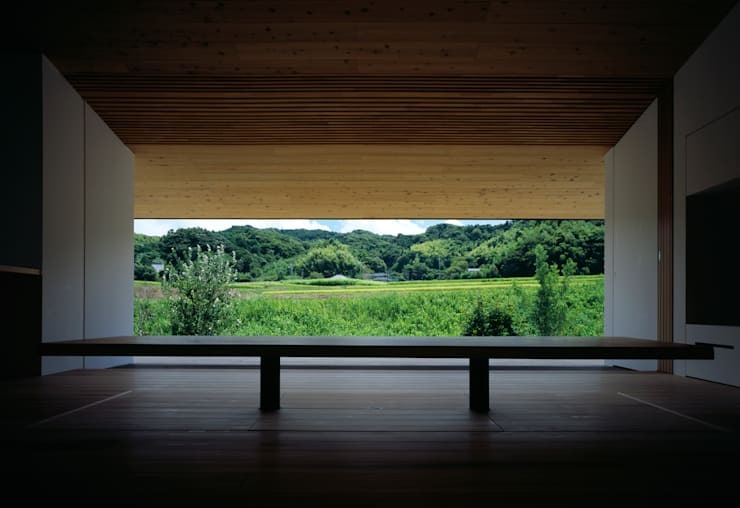 And so they commissioned Ishii Hideki Architect Atelier to design a weekend home for them in the rolling countryside. As the couple intended to use the getaway often, it was important for them that it felt like home, a second home. The final design features a sleek rectangular structure whose simplicity is mirrored in the interiors as well. The expansive living areas overlook the gorgeous countryside providing for a perfect getaway while being as comfy as back home. Here's a facade that is a contrast to the context! 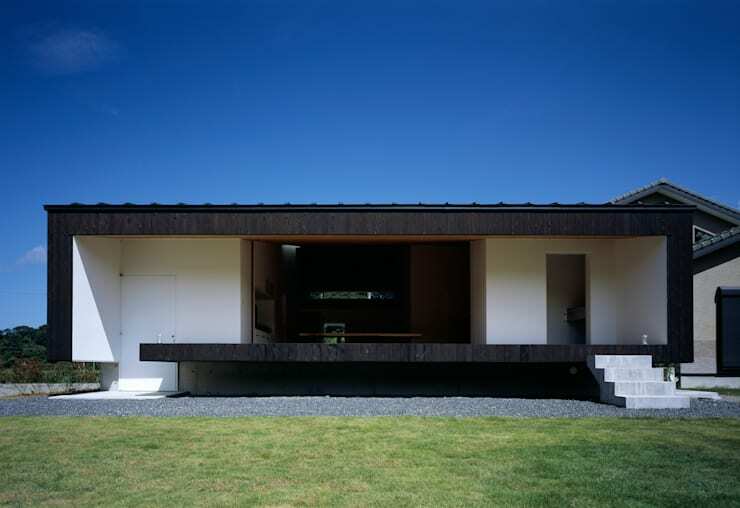 The structure stands out with its use of a dark wooden frame and white surface. Interestingly enough though, it does not clash with the surroundings, perhaps owing to its flat, low-laying design. To give the modern facade a slightly traditional feel, the house has been designed with a sloping roof (not seen in this image). The large glass sliding doors in the front serve a dual purpose: it makes the house look welcoming, and it invites the bucolic exteriors inside into the living spaces keeping it bright and airy. 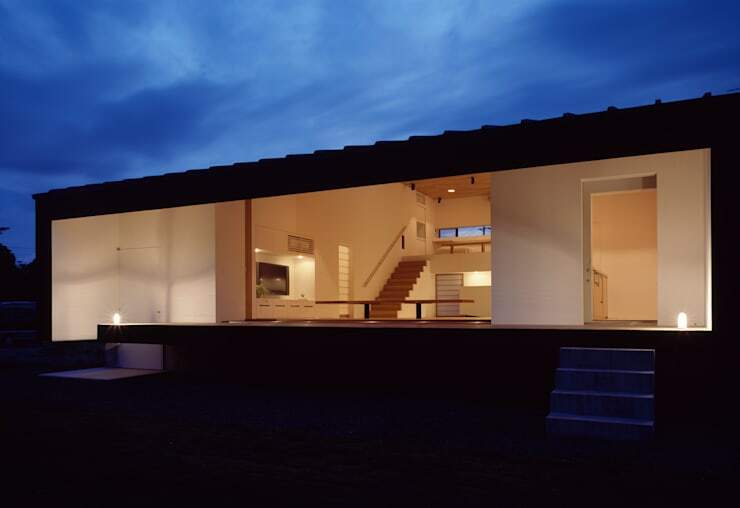 The advantages of that sloping roof can be seen in this picture. While it may seem from the outside as a fairly limited space, the sloping roof ensures that the space inside literally opens up. The area has been designed in such a way that your eyes are naturally guided straight and upwards toward the mezzanine where the bedroom is. Wood dominates the interiors imparting a warm, cosy feel to the space. The architects, keeping in mind the owners aesthetic style, kept the style minimalist while not scrimping on the comfort factor. 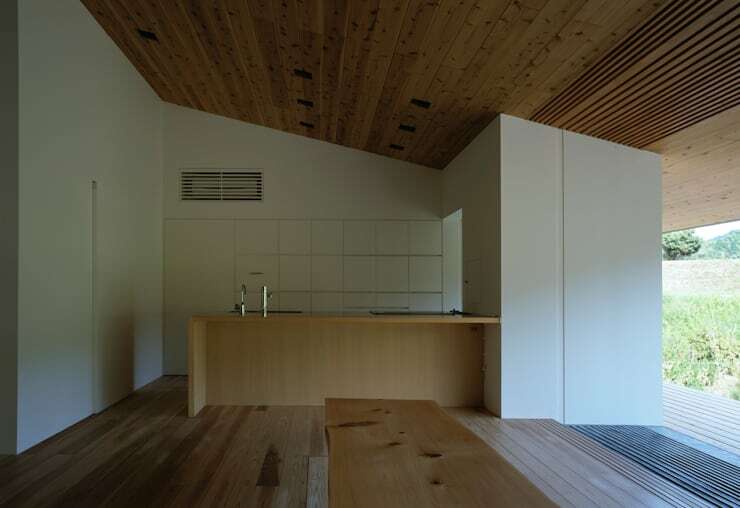 To the right of the entrance is the super-minimal, modern kitchen. When you're on a getaway, cooking isn't exactly on the top of your priority list so the architects didn't have to worry about building in too much storage space. There's only the very basic necessities here: a sink, a working space and an oven. Know what we mean? Thanks to the glass sliding doors, this view is accessible from the kitchen, living room and the mezzanine bedroom. A simple, long bench is the only piece of furniture here, and really do you need anything else? An identical bench is placed on the mezzanine floor, where you can take in the view, if you're feeling a bit too lazy to saunter downstairs. Countrysides are gorgeous in the daytime, but come dusk and nightfall, the romance factor multiplies rapidly. And when you have a house like this to retreat to, we imagine it goes off the charts. With the lights switched on at night, the house feels like a warm hug. When the owners want to keep light and prying eyes out, they can pull down a rice paper screen that covers the glass doors. Perfect, or what? To see a retreat created in a suburban space, check out The real secret garden home. What did you think of this sublime countryside getaway?